Figure 4 shows the distribution of the residuals which is the result of in situ minus satellite derived monthly temperature anomalies in a 1°x1° grid. This analysis of over 10,000 data points with a standard deviation of 0.76°C indicates that the satellite derived monthly temperature anomalies have a strong correspondence to the in situ based anomaly. It is important to note that these differences can be ascribed to several factors: errors in the derived temperatures, in situ measurement errors, variations in atmospheric contributions, differences between point measurements and spatially integrated values, and discrepancies between shelter height temperature anomalies and those at the radiating surface. An analysis of the spatial structure in the satellite-derived field consistently demonstrates strong coherence well within 0.5°C. 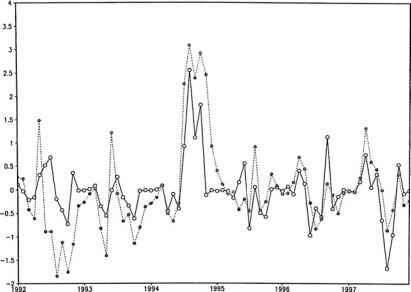 The time series of monthly anomalies across the study area over the period 1987 through 1997 is presented in Fig. 5; the period between 19891991 removed due to erroneous satellite measurements at 85 GHz. 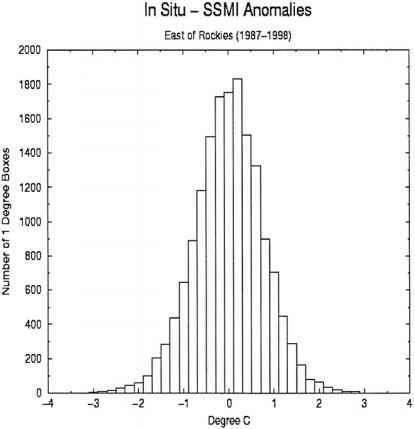 The regional anomalies generally fluctuate between -2°C and 2°C and the average fluctuation from the mean is 1.15°C. The two data sets share most of the variance, i.e. have a high signal to noise ratio, with a mean difference of 0.34°C, while the spatial correlation coefficient (r) over the time series is 0.92. Fig. 6 shows a time series of the difference between the two data sets. There are two occasions when the differences exceed 1°C. During almost every month the differences were far less than the actual temperature anomaly. 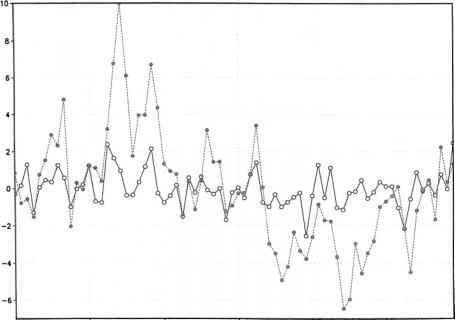 The difference series indicates some temporal auto-correlation, which we will investigate in a future analysis. Since there are some unanswered questions on the second or third order drift characteristics of the satellite, we may be seeing an error associated with changes in the radiometer's precision over time. The temporal correlation in each grid box of the study area is mapped on Fig. 7. There is a significant area where the correlation coefficient (r) exceeds 0.90, this areas covers portions of the Northern Plains, Midwest and Tennessee Valley. The majority of the study area has correlation coefficients greater than 0.80, which means that over two thirds of the variance is shared between the in situ and satellite derived temperature anomalies. There are some limited areas where correlation coefficients drop below 0.70. One of these are areas is western Texas where we have investigated potential causes to the lower correlation over this area and have not been able to identify any particular source of the problem. Another area with a lower correlation is the lower Mississippi Valley. This area experiences extreme flooding during part of the year. When there is extensive surface water, the relationship between channel measurements becomes non-linear and introduces noise in the derived product. In general the two fields have both high spatial and temporal correlation throughout the study. (peterson et al. 2000). The spatial resolution of the data set was defined by the existing 1x1 degree SST data base. 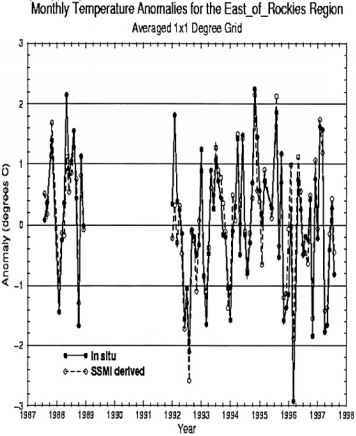 The SSM/I data could provide 1/3rd degree resolution but averaging up to the SST's 1x1 degree made the data set more robust by helping remove outliers (the averaging being done with a biweight approach; Lanzante 1996). 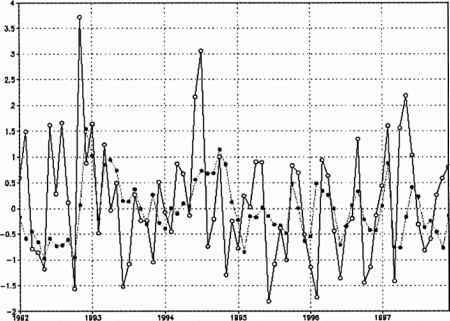 The temporal resolution, monthly, was defined by high-quality internationally exchanged in situ climate reports which are more reliable than calculating, for example, weekly means from incomplete synoptic reports. And the period of record was governed by data availability from the passive microwave satellite, i.e. the period 1992-present. The GHCN uses climate data from approximately 1,400 stations are exchanged internationally each month. A station's monthly mean temperature is calculated by the source station or country before being transmitted. While thousands more stations transmit synoptic messages over the GTS, monthly means derived from synoptic reports have serious data quality problems primarily because synoptic reports are seldom complete (e.g., Schneider, 1992). Therefore, no data derived from synoptic sources are used in GHCN. Our approach to blending the data focused on minimizing the impact of significant though rare errors in each of the data sets rather than producing a data set with a slightly more accurate mode. Toward this end, we (a) transformed the data into anomalies to the 1992-present base period so all interpolation or merging was done in anomaly space; (b) interpolated GHCN data out only a modest distance where the interpolated values are most reliable, covering a 5°x5° square centered on the station; (c) weighted all GHCN-derived values equally, that is, an anomaly value interpolated out 2 degrees is given the same weight as a station in that 1x1 degree grid box; and (d) gave the SSM/I anomaly value for a 1x1 degree grid box the same weight as a single in situ station. This means that for land areas with many in situ observations, the final product primarily represents in situ anomalies. If there is only one station in the vicinity, the product reflects both the interpolated in situ and SSM/I-derived anomalies equally. Where no in situ data are present, the final product is purely SSM/I-derived anomalies (e.g., in much of the tropics) or missing (e.g., snow-covered areas). To ensure that changes in satellite drift or degradation of the SSM/I instrument doesn't impart a bias to the product, each month's SSM/I analysis was adjusted to anchor it on the in situ observations. 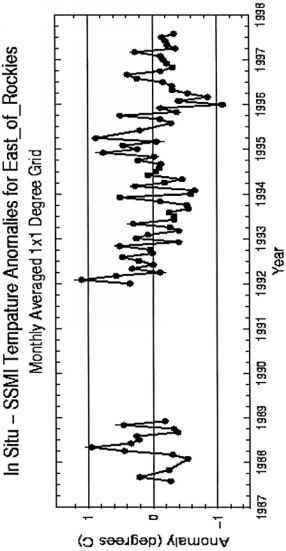 The difference between every GHCN station monthly temperature anomaly and the SSM/I anomaly for the 1x1 degree grid box containing the station, if available, was calculated. The monthly anomaly used in this calculation was based on a mean of only those years that have both GHCN and collocated SSM/I temperatures. The mean difference for each calendar month was determined. Next, the monthly time series of these differences was smoothed with a three month running average filter to allow more data points to contribute to the calculation of the adjustment. This smoothed difference value was then added to every 1x1 degree SSM/I grid box anomaly value. The final 1x1 degree product is not fully global. Snow and ice-covered regions are limited to in situ observations. Note the excellent coverage in Figures 4d and 5d in the in situ data sparse tropics. Clearly there is a spatial coherence to the structure of the monthly climate signal captured by this data set. While it is not error free, it does clearly define the regions of significant climate anomalies and is therefore very useful for monitoring the climate in regions that were previously data sparse. It also shows the spatial structure and cohesion far better than any of the individual data set could provide. We compared the BWI directly to precipitation derived from the Global Precipitation Climate Program (GPCP), using anomalies from the 1992 through 1997 base period. Analysis were performed over six regions of the globe, each corresponding to an agricultural area on a different continent with spatial dimensions of 5° by 5°. The background characteristics of each region are used to understand the unique relationship between precipitation and the BWI. Correlations between the two fields were derived in the monthly anomalies over the 6 year period. The precipitation anomalies were also aggregated over multiple months, in order to determine the memory of the BWI and its correspondence to upper level soil moisture. Memory in the BWI implies that it retains information on precipitation anomalies during the earlier period, and that it can show how these cumulative values impact the upper level soil moisture. Southeastern Australia (32.5°N - 37.5°N and 145°E - 150°E) is one of the most important agricultural areas in Australia, a region where wheat, corn, and oats is grown in abundance. Precipitation is fairly evenly distributed throughout the year, with a slightly higher concentration in the summer. 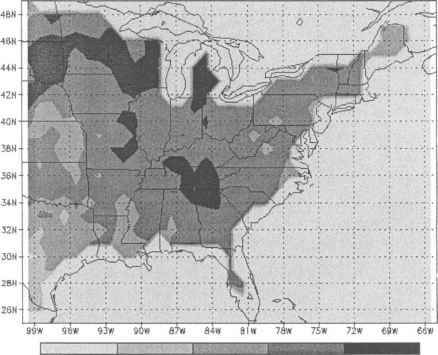 The strong correspondence between precipitation and the BWI anomalies is illustrated by them sharing 65% of their variance (fig. 8). When the precipitation anomaly was aggregated between the previous and concurrent month, the explained variance drops to 44%. 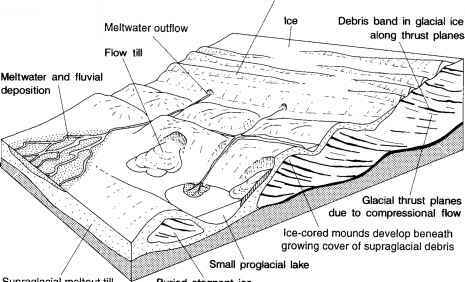 The weak memory is associated with the inability of the wetness index to see below the surface, large porosity in the soil, and moderate precipitation amounts that fall over the areas. Therefore rarely does the water pool near the surface for any extended period, and surface moisture is usually depleted within a two month period. We compared the anomalies over central (45°N -50°N and 00°E - 5°E), where the major crops include: wheat, grapes, oats, barley, sugar beets, fruit trees, and grazing land. Annual precipitation in the region averages between 600 to 800 mm, while the mountains in the southern section have an orographic influence, where some up-slope areas receive over 1200 mm, while downwind areas receive less than 500 mm. Precipitation is fairly evenly distributed throughout the year over this region. Across the time series two data sets share 22% of their variance (fig. 9). When the wetness anomalies were correlated with the precipitation anomalies aggregated between the concurrent and previous month, the explained variance rose to 40%. Furthermore, it rose to 63% when the precipitation anomaly from the previous two months was added with the concurrent month. The strong memory implies that the BWI is a good proxy to the upper level soil moisture, which frequently has a two month memory of precipitation in this region. Northern Argentina (37°S - 32°S and 63°W - 58°W) is an extremely important source of wheat, corn oats, millet, potatoes, flaxseed, and soybean. The precipitation across the region averages around 700 mm a year, and is slightly drier to the west. Rainfall is most abundant in summer, it is lowest in winter, and the seasonality increases towards to the west. The two data sets share 29% of their variance across the monthly time series (fig. 10). When the precipitation anomalies were aggregated between the concurrent and previous month, the explained variance rose to 49%, and it rose to 59% when the precipitation anomaly from the previous two months was added with the concurrent month. This result indicates that the BWI has memory that corresponds with upper level soil moisture. The region in the western Sahel (5°W - 0° and 10°N - 15°N) supports grazing land, millet, sorghum, peanuts, soybeans, corn, and cotton. The climate is semiarid with the rainy season primarily restricted from June to September. Annual precipitation averages around 100 cm with a clear gradient of wetter to the south and drier to the north. An 8 months from October to May generally accounts for less than 25% of the annual precipitation. The two data sets share 45% of their variance across the time series (fig. 11). When the wetness values was correlated with the precipitation anomalies aggregated between the concurrent and previous month, the variance rose to 61%, and it rose to 78% when the precipitation anomaly was aggregated from the two previous months. This relationship supports the fact that the wetness anomaly corresponds with the upper level soil moisture, although an early or late start to the rainy season can confuse the signal. NORTHEAST ARGENTINA MONTHLY ANOMALIES OF SSMI DERIVED SURFACE WETNESS MONTHLY ANOMALIES OF GPCP DERIVED PRECIPITATION SOLID LINE: PREC1P. 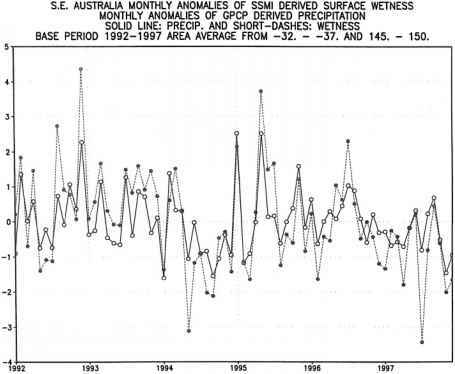 AND SHORT-DASHES: WETNESS BASE PERIOD 1992-1997 AREA AVERAGE FROM -37.--32. AND -63.--58. The region in the east central China (112.5°E - 117.5°E and 30°N - 35°N) primarily grows rice and cotton. Precipitation in the area ranges from 1300 mm in the south to 700 mm to the north. Precipitation has a summer maximum followed by autumn and spring, while the winter season receive less than 10% of the annual precipitation total. The two variables share 40% of their variance in common (fig. 12). The figure indicates that the correlation would be much higher except for a few notable outliers. Another reason for the moderate correlation is the widespread irrigation of rice patties over the area, since the source of water covering the surface does not correspond with precipitation. The correlation slightly drops as precipitation anomalies from the previous month were aggregated with the concurrent month. This drop may correspond to the density and type of vegetation, which intercepts rainfall, and partially hides soil moisture from the satellite. The region in the southeastern United States (30°N -35°N and 90°W -95°W) primarily grows corn, soybean, cotton, and pine trees. Annual precipitation across the area averages around 1300 mm a year. Over 100 days of year receive more than 0.25 mm , and about 35 of those days receive more than 35 mm, accounting for 80 percent of the total precipitation. The two variables share 10% of their variance in common (fig. 13). This weak relationship is caused by dense vegetation (pine and hardwood trees) throughout the year, and crops with a high leaf area index. Therefore, under densely vegetated conditions, the wetness signal observed by the satellite does not have a strong correspondence to the soil moisture. None-the-less, the shared variance nearly doubles, rising to 17% when the precipitation anomaly from the previous month is added to the anomaly from the concurrent month. This indicates that a appreciable signal does still come from the ground, during at least a portion of the year, and that the wetness index has memory of precipitation from the previous month. SOUTHEASTERN U.S. MONTHLY ANOMALIES OF GPCP DERIVED PRECIPITATION MONTHLY ANOMALIES OF SSMI DERIVED SURFACE WETNESS ft SNQWCOVER SOLID LINE: PRECIP. 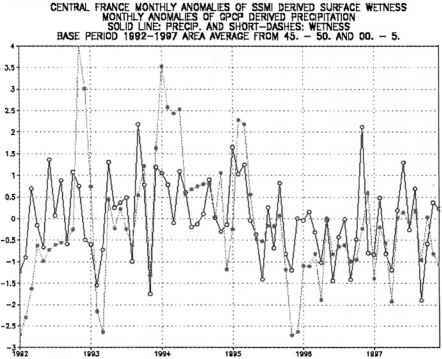 ft CASHED UNE WETNESS BASE PERIOD 1892-1997 AREA AVERAGE FROM jq. - 35. AND -B0. - -65.